Brand Recognition: The Movie fits as an alternate title for this film. I am going to start off this piece by trying to process all of the logos and icons that are thrown at the audience during a single scene of Ralph Breaks the Internet, let alone throughout the entire movie. That being said, most of it pays off inside of the story. So, if product placement was your biggest reservation going into the film, don’t sweat it too much. Again, there is a lot, but Disney handles the overload well. 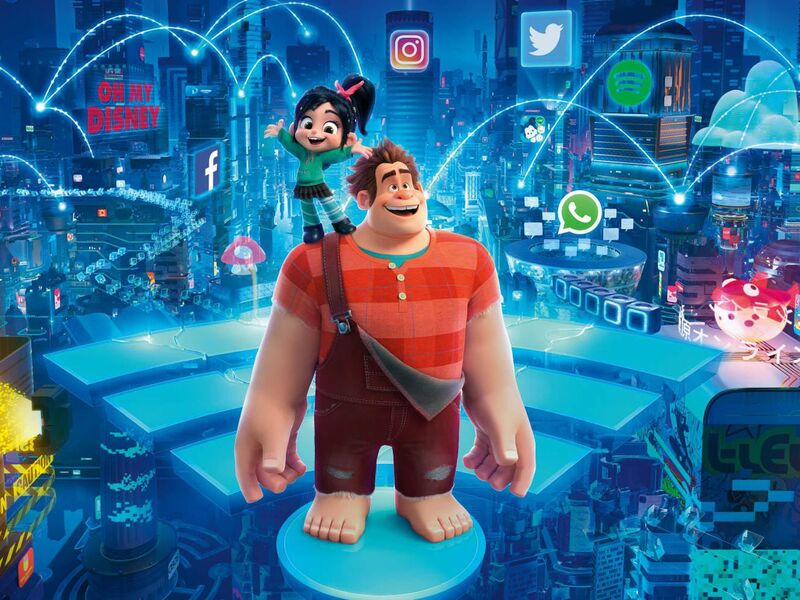 Ralph Breaks the Internet delivers both a solid sequel and a decent satirization of internet culture. Six years after the events of Wreck-It Ralph, things are grand at Litwak’s Arcade. Ralph (Reilly) and Vanellope von Schweetz (Silverman) hang out every night, drink root beer, and have fun being best friends. While Ralph loves the routine, Vanellope wishes for something new. When an accident puts Vanellope’s arcade game in jeopardy, Ralph and Vanellope head to the internet in hopes of saving Sugar Rush. The internet is a vast and terrifying place for Ralph, but is it just what Vanellope has been hoping for? With the aid of new characters such as Shank (Gadot), Yesss (Henson), JP Spamley (Hader), and a handful of iconic princesses, Ralph and Vanellope race to save the game and their dreams. I liked Wreck-It Ralph, but I can’t say it’s one of my favorite Disney movies. However, I really enjoy pop culture, so Ralph Breaks the Internet still appealed to me. As a fan of classic Disney, it was also tantalizing to see every Disney princess pop up in the same trailer as Iron Man and a Stormtrooper. John C. Reilly and Sarah Silverman are always comic delights, so I expected this movie to be decent at the very worst. While it has larger faults than some of Disney’s more recent films, it still manages to live up to the legacy of the original. This is primarily a kids movie, and it’s important to remember that when reading the review. However, I will be nitpicking this on a more adult level. Long story short, kids will love it, but here’s where adults may or may not like it. Let’s get the most glaring fault out of the way first. Ralph Breaks the Internet features a lot of lag, as in the movies pacing always seems to be jumping around. Sometimes the story is moving a mile a minute, next thing it takes the characters twenty minutes of screen time to accomplish something in an hour of movie time. The entire film takes place in about 36-hours of Ralph’s world, but it jumps around a lot. The worst occurrence of this happens when sixteen hours of in-film time takes up less of the movie than the remaining eight hours. This inconsistent pacing leads to some clunky conflict. The film lacks a central villain and makes up for it with a series of intertwining conflicts between Ralph, Vanellope, and the cast of supporting characters. Some of these conflicts have genuine causes and effects, but most of them fall flat of hitting their mark. The final conflict of the film doesn’t even take legitimate shape until shortly before the film’s climax, and it is resolved almost as suddenly as it is created. The film suffers not because there is no central villain, but by forcing the lovable heroes to be their own worst enemies. Disney’s signature brand of style and humor is back in full force for Ralph Breaks the Internet. While the film is much more on the nose than is typical of the studio, it still feels perfectly Disney. The way that animators brought the intangible concept of the internet to life plays out not only in a strong narrative structure, but with a series of hilarious gags for all ages. Disney heavily benefits from its own near-Century’s worth of characters, locals, and icons. Pooling from Walt Disney Animations Studios, Pixar, Marvel, and Star Wars, Ralph Breaks the Internet revels in a thoroughly immersive world. Part of what makes Ralph Breaks the Internet so immersive is the fact that there is minimal world-building to do. The primary setting — Litwak’s arcade — is already fleshed out from the first film, and the new setting of the internet is built up of product placement and brand recognition. The film forgoes made-up websites in favor of recognizable ones such as Google, eBay, and Twitter. While made-up sites and games are central to the plot, their real-life equivalents are used to introduce audiences to the world and concepts of these made-up sites. The first film used this same tactic by introducing real-life video game characters such as Sonic, because it pushes the audience into the world faster than introducing new characters could. Ralph Breaks the Internet takes this shortcut once again by utilizing the Disney Princesses for several key scenes in the film. It’s entertaining, and it’s cool, but it feels a little gimmicky. Rather than breathing new life and ideas into the film, the film leans a little too heavily into what is safe and familiar. Ralph Breaks the Internet is good, not great. Your kids will love it, you’ll enjoy, but it won’t go down in history with the likes of Aladdin (1992) or Frozen (2013). It’s got plenty of heart, but overall it just feels like filler while Disney Animation cooks up something new. However, it does have one of the funniest post-credits scenes of all time. So if nothing else, go see it for that and the overwhelming nostalgia. Thank you for reading! What did you think about Ralph Breaks the Internet? Comment down below! Next story ‘Bohemian Rhapsody’: Why is There a Rift Between Fans and Critics? Previous story Should J.K. Rowling Stop Writing the ‘Fantastic Beasts’ Films? I dunno, this was an A+ in my book. I’m not a huge fan of the first film, so I’m hoping to like this one a bit more.